Origin: Mandalay has people from Myanmar, Kayin, Kayah, Chin, Pao, Mon, Shan. Most people speak Myanmarese/Burmese, Shan, Chinese, limited English and follow Buddhism, Christianity, Islam, Hinduism. 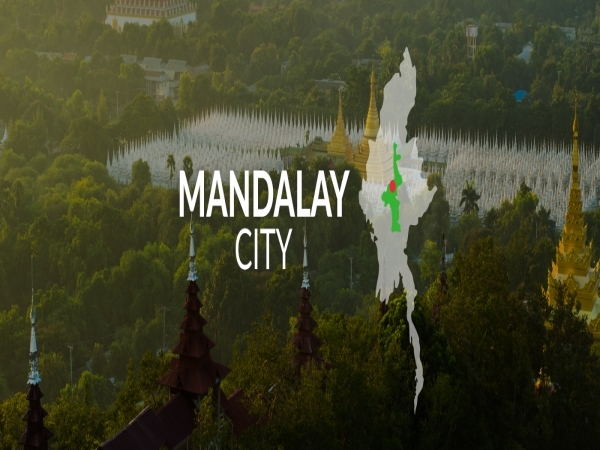 Geography: Mandalay has a mild climate with no rainy season like a dry zone. It is bordered by Magway Region, Sagaing Region and Shan State. It spreads across 37,024 sq.km/ 14,295 miles. Interesting Facts: Mandalay City is the capital of Mandalay Region and is the former capital of Myanmar. As per 2014 data, 6.1 million people live here. Royal Palace Mandalay hosts the erstwhile royal city which houses the royal palace and a museum. It is located on a square citadel surrounded by four 2-kilometre long walls with 48 turrets and 12 gates, one for each zodiac. Encircling the citadel is a picturesque 60-metre wide moat with a number of bridges. The complex contains audience halls, throne halls, a monastery, a watchtower, a court building, a tooth relic building and a library. U Bein Bridge Amarapura is an old capital of the KoneBaung dynasty and is famous for silk weaving. U Bein Bridge, built in the mid 19th century using reclaimed teak from dismantled buildings, is a glorious sight especially in the early evening as it becomes silhouetted against the vivid sunsets. Worth a visit nearby is MaharWai Yan Bon TharBargaya Monastery, decorated with over 28,000 carved wooden figures. Mingun A compact riverside town in Sagaing Region, Mingun lies on the Ayeyarwady River on the west bank about 10km from Mandalay. It is a popular excursion and worth spending at least half a day exploring its impressive sights. Arriving by boat from Mandalay is the most enjoyable although you can also arrive by road from Sagaing. Mingun is of immense historical significance and holds monuments which stand evidence of history. One can explore the Mingun Bell, Mingun Pahtodawgyi and the Hsinbuume Pagoda n Mingun. Innwa (also known as Ava) the capital of several kingdoms between the 14th and 19th century, is located on the banks of both the Ayeyarwady and Myitnge rivers. It is about 21km from Mandalay and its main attractions are the 19th-century MahaAungMyeBonzan Monastery and the BagayaKyaung Monastery supported by nearly 300 huge teak stilts built around 1830. It is known for its intricate woodcarvings. Pyin Oo Lwin At an altitude of 1,070m, Pyin Oo Lwin is the nearest hill station with a cool alpine climate. It is the perfect escape from the heat of the Mandalay city. The refreshing colonial hill station of Pyin Oo Lwin was a summer retreat during British rule. It takes around 1 hour 30 minutes to reach Pyin Oo Lwin from Mandalay and can be reached through road or train. Kyauktawgyi Pagoda also known as the Pagoda of the Great Marble Image, stands at the foot of the Mandalay Hill. It was built by King Mindon in 1865 and houses a large image of Buddha sculpted from a single block of beautiful Sagyin marble. One of the largest festivals of Myanmar, Kyauktawgyi Paya, is conducted at this place in October which attracts tourists from all over the world. Hsinbyume Three years before King Bagyidaw succeeded to the throne, he built Hsinbyume Pagoda in 1816, in memory of his late wife the Hsinbyume Princess. A representation of the Sulamani Pagoda, this pagoda stands atop Mount Meru. The seven wavy terraces around the pagoda represent the seven mountain ranges around Mount Meru. Badly damaged in 1838 by a quake, it was restored by King Mindon in 1874. Saint Joseph’s Cathedral also known as Father Lafon Church is a lovely and pleasant Roman Catholic church in Mandalay well cared for by the local parishioners. It is a gothic style architecture church built by French Fathers in 1894. The interiors of the church have decorations of gold, the beautiful colour of Myanmar. Stone Carving The marble carving workshops are near the Mahamuni Pagoda. Marbles are sources from the Sagin quarry around 56 kilometres north of Mandalay. Many religious items, mainly Buddha images and stone slabs for inscription are produced at these workshops. Tourists can visit these workshops, understand how the craft is done as well as purchase some memorabilia. Wood Carving The Mandalay area is famous for intricate wood carving work. There are several wood carving workshops located all around which produces ornate items ranging from religious statues to decorative flowers. These workshops are located near the Mahamuni pagoda and are worth a visit. Bronze Casting WorkshopsTourists can visit bronze casting workshops at the Tempawaddy ward located between Mandalay and Amarapura. Statues of Buddha, bells, gongs, tri-gongs and other products are made in these workshops. These are great places to pick up some gifting items. Zegyo Market Tourists who would like to take a glimpse of the local market as well as indulge in a shopping spree can visit the Zegyo Market Place located at the heart of Mandalay. One can get practically everything here – from groceries to fine fabric. Tourists can pick up souvenirs and local products here. Chinese Temple One of the delightful places to visit in Pyin Oo Lwin, built by Yannan immigrants is the Chinese temple. Built in a typical Chinese architecture and exhibiting traditional Chinese art, this temple is also home to an orphanage and nursing home. The shoe-friendly ground includes a Chinese style six-storied tower. The temple is home to innumerable monks who predict future upon receiving a small donation from people. Dattawgyaik Waterfall A place for trekking travellers, the Dattawgyaik Waterfall is located in Ani Sakhan, a half-way point between Mandalay and Pyin Oo Lwin. The height of the waterfall is nearly 400 feet (122 metres) and the depth is about 300 feet (91 metres). It has blue water and fresh air to relax. The best time to visit this waterfall is between May to October (monsoon season). Bagaya Monastery With the famous 267 teak pillars, Bagaya Monastery is one of the most aesthetic monasteries of Myanmar, located in Le Daw Gyee, the great royal rice fields, in Innwa. The best way to visit this monastery is to walk along the narrow path across the field. The carving creatures on the doors and walls are still well maintained. The main hall has a platform and monks’ quarters. Jade Pagoda named ‘Werawsana’, is the world’s largest jade pagoda. The structure of pagoda is entirely built with jade pieces and slabs which cost US$15 million. It is 75 feet 6 inches in high and 175 feet in circumference and each terrace is 52 feet 6 inches in long and broad and 12 feet in high. 30,000 Jade Buddha statues decorate the outer structure of the pagoda. Kaungmudaw Pagoda also called Yaza Mani Sula, is located 10 kilometres from Innwa. It is known for its egg-shaped design, something unusual for a Burmese pagoda. It has an enormous dome, which rises up to 46 meters. At the base of the pagoda, there are 812 stone pillars, each hollow and an image of a Nat in it. It was modelled after the Mahaceti Pagoda in Sri Lanka. Me Nu Oak Kyaung The Maha Aung Mye Bon Zan, well known as Me Nu Oak-kyaung (Brick Monastery), was built in 1818 by Nanmadaw Me Nu, Chief Queen of King Bagyidaw for the Royal abbot (Nyaunggan Sayardaw). This monastery is well-known as Me Nu Oak Kyaung which translates to Me Nu’s brick monastery. The Maha Aung Mye Bonzan Monastery is a fine example of Burmese monastery architecture during the Konbaung dynasty. Mahar Gandarone Monastery This monastery is situated in Amarapura Township on the Western bank of Taungthaman Lake near the famous U Bein Bridge. The monastery was built around 1910 and is a well-known monastic college complex for monastic study in the world. The monastery is very strict and rigid in religious discipline and currently has more than 3,000 monks including very young novices in the monastery. This Peik Chin Myaung limestone cave is located 19 km northeast of Pyin Oo Lwin. The entrance is adorned by beautiful springs. The cave is ages between 230 million ad 310 million years and has innumerable Buddha images and pagodas of varying sizes at every nook and corner. A beautiful waterfall named ‘Three Layers Waterfall’ lies just a short walk from this cave. Maha Myat Muni Pagoda Festival: This festival is celebrated for 2 days in February at the Maha Muni Pagoda. Devotees light bonfires and cook huge pans of sticky rice with ginger, coconut and sesame to offer to monks during the festival. Shwe Sar Yan Pagoda Festival: This festival is celebrated for 9 days at the ShweSar Yan Pagoda. It is an interesting festival attended by villagers and visitors. The main attractions of this festival are the folk toys woven out of dried palm fronds. Taung Pyone Festival: This festival is held for 8 days, in the Taung Pyone Village. It is attended by thousands of mediums and worshippers. A ritual is celebrated each day. Toddy palm wine, whisky, rum, grilled rabbit and fried chicken are offered to the two-spirit Min Gyi and Min Galay, the serving kings of Bagan in the 11th century.